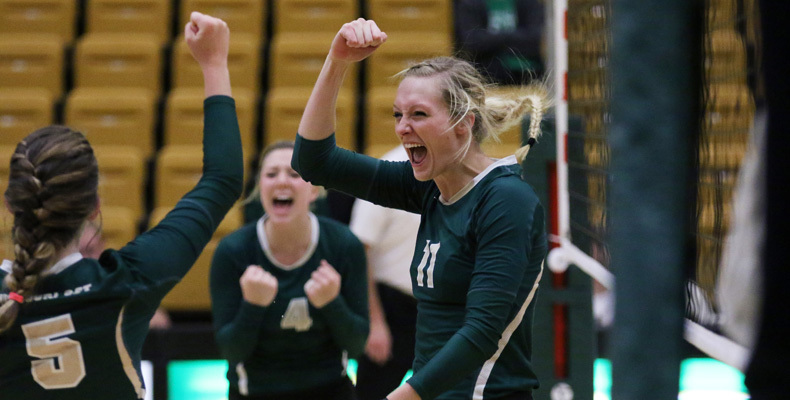 Krista Haslag, a senior from Linn, Missouri, celebrates with her teammates after the S&T volleyball team defeated the University of Missouri-St. Louis on Oct. 3. Krista Haslag, a senior on the Missouri S&T volleyball team, knows a thing or two about competing. The 6-foot-1 senior from Linn, Missouri, racked up 18 kills over the weekend to become the university’s all-time leader in career kills with 1,257. (Erin Bekebrede, who played for the Miners from 2008-2011, held the previous record of 1,243 kills). Coach Jason Holt credits Haslag, Gracey Moon and Jackie Pyles, the team’s three co-captains, with providing the leadership and determination to help the team go undefeated at home – the first time a team has done so in the program’s history. The feat has helped earn the team a postseason spot for the fifth season in a row. Growing up, Haslag’s number one sport was basketball. In fact, it wasn’t until high school that she started playing volleyball competitively for the Central Missouri Volleyball Club. Krista Haslag goes up for a hit during a game against the University of Missouri-St. Louis volleyball team on Oct. 3. The student-athlete, like her teammates, takes her coursework just as seriously. For the past six years, the volleyball team has earned Academic Team Honors from the American Volleyball Coaches Association for keeping a team GPA of 3.3 or higher. Recently, Haslag became the fourth player to earn College Sports Information Directors of America (CoSIDA) Academic All-District honors. It was the third time she has received the recognition. A double major in civil and architectural engineering, she says she chose the two majors because of an early interest in the skylines of cities. Haslag leads the team in hitting percentage and blocks. 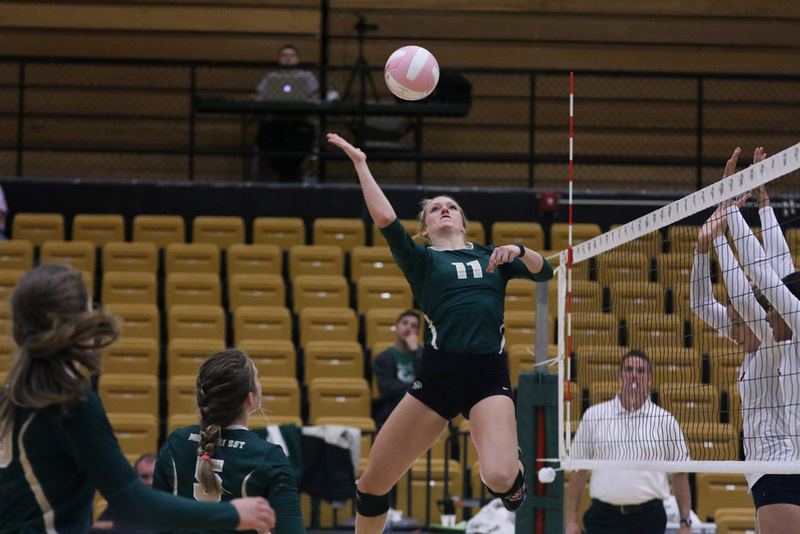 She’s also earned a number of honors – a first team All-GLVC selection, American Volleyball Coaches Association (AVCA) All-Midwest Region honors and AVCA All-American honors. S&T returns to action on Friday night when it travels to St. Louis to take on the University of Missouri-St. Louis at 7 p.m. at the Mark Twain Center.